The Buyer: Management team of Paige Technologies, LLC. with private investment from a former senior executive with more than 20 years of experience in corporate leadership. The Seller: Paige Technologies, LLC. is an IT staffing and consulting firm, providing resources for: onsite maintenance, project management, structured system analyses and design, application development, in addition to software development, testing and language-based programming. The owner was ready to move on to other ventures after 17 years of managing the company. The Close: After years of attempting to sell the company for a premium and as a non-standard structure, the seller was approached by the management team to purchase the business. 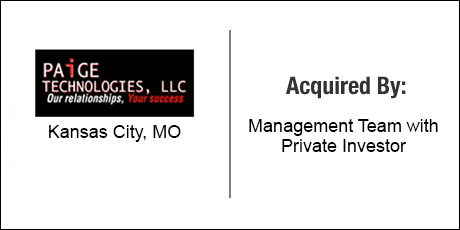 The management team needed a financial partner in order to accomplish the transaction. DVS helped the management team vet multiple prospective financial partners and eventually found them an out-of-town private investor from the DVS internal pool of clients. Simultaneously, DVS managed the banking requirements for funding, negotiated a feasible structure for the seller in regard to the premium price and terms desired and worked with all advisors to craft the appropriate agreements for the 5 parties associated with the transaction: management team, private investor, seller, bank and purchasing partnership entity.